In complex views, it’s hard to work with containers that have lots of artifacts. If all you need is to see how many artifacts you have, right-click on the canvas and select Show count. You can also click in one container to just see its count. 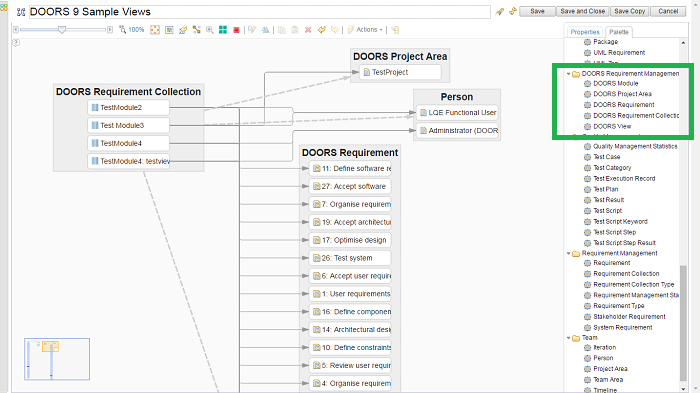 This feature opens the door for a number of interesting use cases such as the one shown in the following image, a V-Process model with Artifact Count. You can see at each stage of the process how many artifacts you have. When you work with views, you can easily change what artifact types to show in a container. 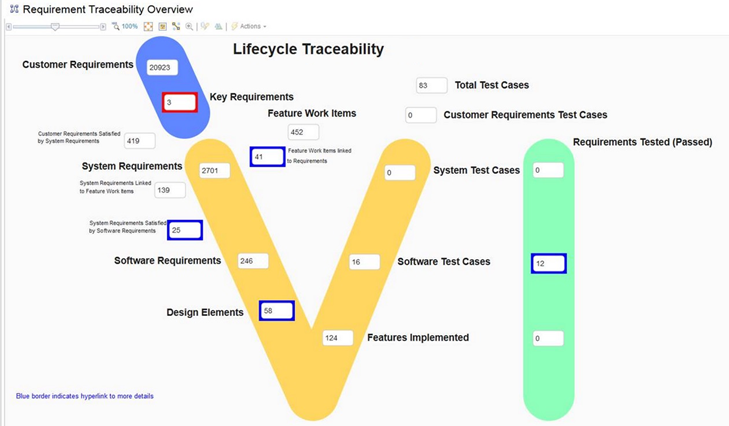 For example, in a view that shows work items linked to requirements, you might want to focus only on defects. To do so, right-click the work items container, click Change Artifact Type, and select Defect. 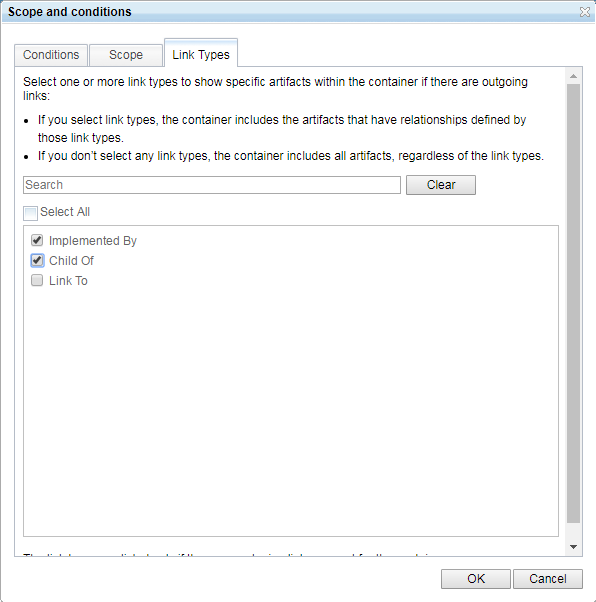 Now, you can manage complex views more easily by focusing containers only on the artifacts you need. If you want to see only artifacts that have links, for example, right-click an artifact and select Edit Scope and Conditions. On the Link Types tab, choose one or more link types. Now the container shows only the artifacts that have the links you need to see. Until now, administrators could import views by adding content packages from a RELM administration page. Now, you can deploy views right on the Shared Views page by clicking the Import icon at the top right. A wizard walks you through the task. You can define the project scope and the conditions for the views you’re importing. We are excited to deliver a number of updates you have been asking for to make RELM easier to use in your projects. You can find out about other RELM 6.0.5 improvements in the New & Noteworthy RELM 6.0.5. Let us know how we are doing. Rational Engineering Lifecycle Manager works with the IBM IoT continuous engineering solution. To download and install the product, go to https://jazz.net/downloads/rational-engineering-lifecycle-manager.